Even though it doesn't feel like we've had much of a Spring, the year is progressing at pace. It doesn't seem like long ago that I was writing about the March equinox but we are now just around the corner from the June solstice. The Frontier team has been out in the woods for a large part of the last few months, teaching our range of bushcraft courses. We've been having a great time and have taught some wonderful people along the way. The recent wet weather has made some aspects of the courses even more challenging than usual. But it's testament to the determination of the students we've had that they've managed to do well regardless. So far this year the response to the content of our courses has been fantastic. Possibly none more so than the Elementary Wilderness Bushcraft Course. The Elementary is one of the backbone courses for those who are serious about progressing their bushcraft skills. Even so, most attendees are surprised by the quantity and quality of material in this course. Feathersticks are one of the many skills covered in detail on the Elementary course. Photo: Ben Gray. It's one of our primary aims for people to leave our courses knowing that there is no way we could have fitted more in to their time with us. This should be evident even if you've attended one of our 1- or 2-day courses. People often wonder what goes on during our week-long courses. So we decided to put together a short video, made up of short clips we've snatched while teaching over recent months. This video, while not exhaustive, highlights many aspects of the Elementary and should provide a good idea of what to expect from this course. 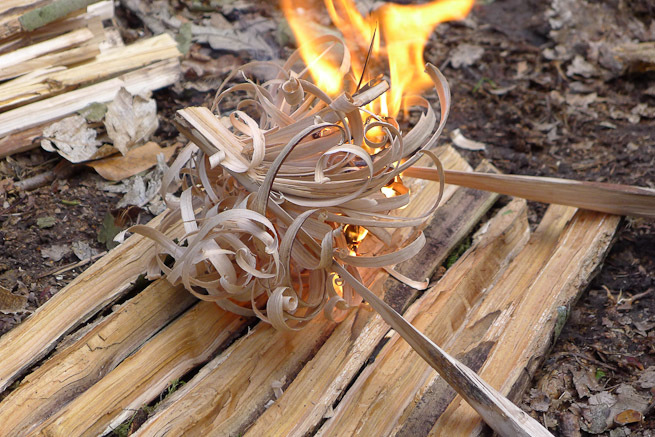 For more information on this course see the full course description page: Elementary Wilderness Bushcraft Course. I hope to see you in the woods soon! ‘Mouth wateringly’ good…. 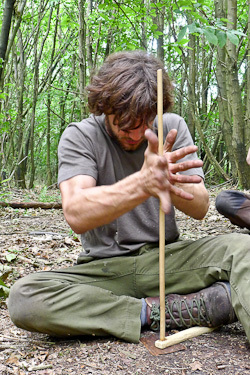 If anyone is looking for a good solid start to Bushcraft, look no further. Well done Paul and Crew ! Thanks Hedgey. Hope to meet you before too long. Great video! Can’t wait for the Intermediate course next month! Great video for your courses. I saw enough on there to know that there’s stuff I can learn and try for the first time, even though I don’t consider myself a beginner…I will get onto one of your courses one of these days! Thanks for your comment. It’s good to know this course has wide appeal. Not only does it provide a solid grounding for the serious beginner, it also provides enough breadth and depth for those who have already committed time to learning skills. It would indeed to be good to finally meet, whether it is on one of our courses or otherwise. Who’s that good looking guy at the top! I have to say, if you want to learn the tools, skills and aptitude to enjoy yourself in the “bush” then look no further. Teachers with an impeccable pedigree and experience (unlike some other schools) who have a detailed understanding and knowledge of their subject. 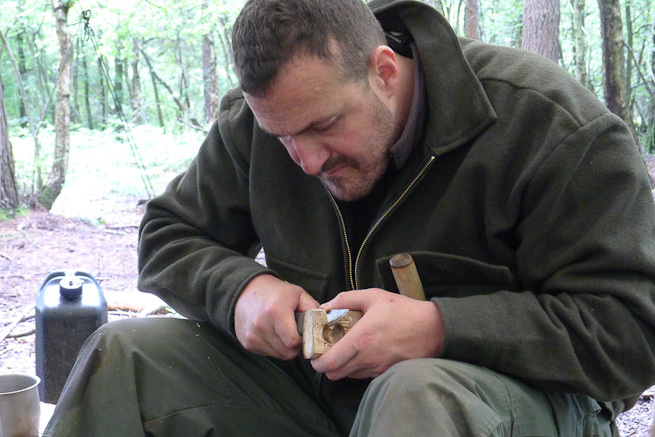 You cannot go much wrong if you want to learn about bushcraft, than spending your money on this course, it is worth it in spades. Thanks Paul and James for a truly memorable experience, I will be back soon!! Thanks for your comment Paul. It was great to have you on the course. We missed you and the other guys after you’d left. You were such a great group to teach, with so much laughter, we had a wonderful time despite the downpours. Great video Paul, I look forward to attending your courses ! Thanks Neil. Hope to see you soon! Thanks. I’m pleased you enjoyed it. Wow, it looks amazing! Congratulations! Sadly, here in Portugal, we don’t have this kind of courses or activities and, for me, its very difficult to afford all the expenses in order to attend your formations. Here, if we want to learn we must dig in the internet and download videos, documentaries and books. At this moment, i have more than 100Gb of information… but not the practice. If one day i have the chance to attend your courses, i’ll probably found a school like yours here! I’m glad to hear the courses look enticing but sorry to hear you won’t be able to make any of them. Not to worry though – if you have a lot of information, then choose an area of interest and start practicing some of the skills. 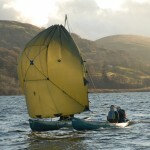 This way you will begin to build up practical experience too. Remember to keep safety firmly in mind if you are using cutting tools or lighting fires. All the best and keep in touch! I really enjoyed this video. Would you be willing to show us how you folded the tarp up in the video? It looked very neat and compact after folding. Thanks for your feedback on the video. Good to hear you enjoyed it. I take it you mean on this blog? Which format would you prefer? Text & photos or video? Let me know when you’re in the states and I’ll be there. A video would be great. Your last video on splitting wood in the snow was fantastic. Thanks again Paul. Yes, that is a long way to come to learn tarp knots 🙂 I’ll see what I can do…. Glad you liked the splitting video. Great video Paul, that has cemented one of your courses on my wish list!